A complete dinner for 4 in less than 40 minutes, using only one pan? We’ve recently made that happen, and the results are in: it is one savory and miraculous time saving dish. Saving both time and money is very satisfying; not losing on flavor is priceless. What you are striving for here in this recipe, is the best chicken that money can buy. Most notably, you should be buying organic, antibiotic-free meat from free range chickens. Slow grown, heritage birds have the best flavor… It is tricky to look through all the labels and know what is best, but don’t let that stop you from eating an excellent source of protein. Purchase what fits into your budget, always keeping your Paleo priorities in check. It might take joining a CSA, or shopping at a local farmers market, perhaps growing some of your own to find the quality you want, and of course, the grocery store always has your back. Shop the outside aisles which focus on real foods and you’ll graciously avoid the additives, preservatives and artificial colorings, focusing on the food that matters – asparagus spears and sugar snap peas. Discover those delightful spring green vegetables and brighten up your dinner! 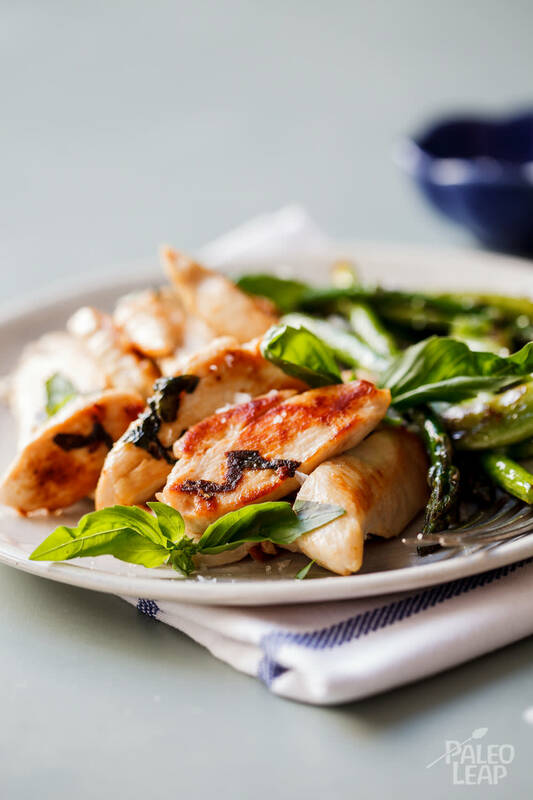 As we’ve said, one-pan basil chicken with spring vegetables is a meal on its own, but what about drowning in a scrumptious dessert every once in awhile? A blueberry chocolate chia parfait would just hit the spot. In a hot pan, add a spoonful of coconut oil then add the sliced chicken. Fry until golden brown then season with salt and pepper; add the garlic, some of the lemon juice and about 3/4 of the basil and cook for another minute. Add the vegetables to the pan, season with salt, pepper and remaining lemon juice, then cook until just tender.